It’s officially Fall here in Houston, and by that I mean the temperature is finally cold enough to whip out the sweaters. 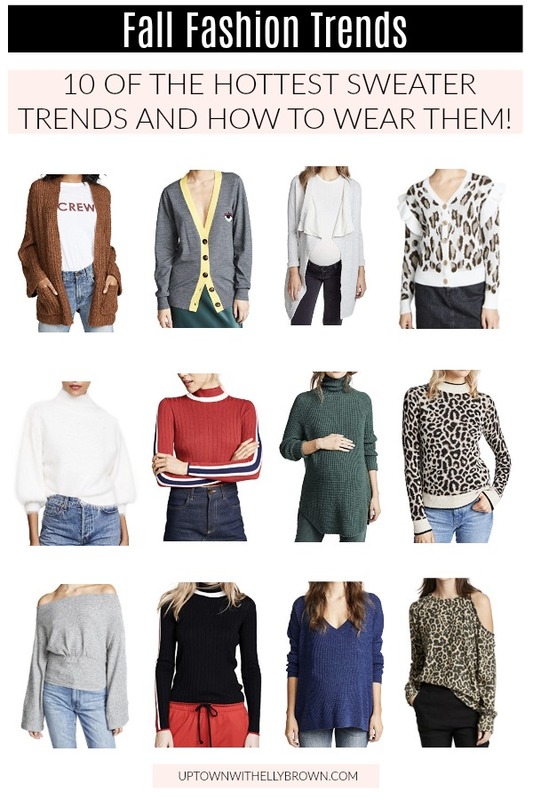 Let’s talk all about this season Fall sweater trends and how to wear them. Grab a cup of coffee, and cozy up! Animal Print. Bring on all the animal print. This may be my very favorite trend out of all the fall sweater trends. Leopard specifically is basically neutral to me. I love pairing red with Leopard; it’s bold and so fun! Cardigans. Cardigans specifically are excellent for all my pregnant mama’s. But it’s also the easiest to wear, and looks great with leggings, because it’s long enough to cover the booty. Varsity. Notice all the varsity feel going on? From sweaters to jackets and even long knit tops, varsity trend is SO big. I love how it brings back high school memories and football games. To pull off the varsity trend, try pairing them with sneakers like converse or Adidas! Oversized. The bigger, the better! Think anything soft, chunky and knit. An oversized sweater is great for curling up at home with a book by the fireplace and your favorite leggings! Balloon Sleeves. Big puffy sleeves, they tend to be fitted on the body, and the sleeves, well, look like balloons. Some are more dramatic than others but do be careful that you keep the rest of your look minimal and keep the focus on the sleeves. Turtle Necks. They come in all different shapes and prints. But a turtleneck indeed never goes out of style. It is a classic, and great for layering! Prints. Animal print, geometric prints, windowpane, tiger stripes, camo, hearts, stars. The list goes on when it comes to a printed sweater. Sweater Dresses. Not pictured in my graphic up top, but the sweater dress trend is big and is also great for my expecting mamas. I think a sweater dress looks chic when paired with a denim jacket and fashion sneakers. Off the Shoulder. Making a comeback from last year, the off the shoulder trend is still going strong! Back to the 90’s. It’s like clueless all over again! From plaid to bold stripes, if you wore it in the 90’s chances are you can wear it again.